Had a request about what I think about All Star Western. I'm not wanting to go into a detailed review of the books because I haven't completed the 70 issue run of Jonah Hex by Palmiotti and Gray, but I think I can write down my thoughts on the series thus far. Let me say right off, I really enjoyed the recent Jonah Hex series. Some issues knocked it out of the park but there were a few stumbles as well. Overall, the run was good and a worthy addition to the character. At one point there was talk of a story where Jonah ran into a family that would eventually birth Harvey Dent. At the time I was somewhat livid about the whole idea since I felt that Jonah was 'outside' the DCU. So, when All Star Western was announced and whole "Jonah Hex in Gotham" came to light, I kinda held my breath, buy the books (they're JONAH HEX! ), and make my decision later. Well, later is now. Palmiotti and Gray have six issues under their belt and they have kept Hex in Gotham the whole time. In that time frame Hex comes to Gotham tracking a few bounties. During that time he is hired by Detective Lofton of the GCPD to assist in tracking down a serial killer. He gets teamed up with Amadeus Arkham. 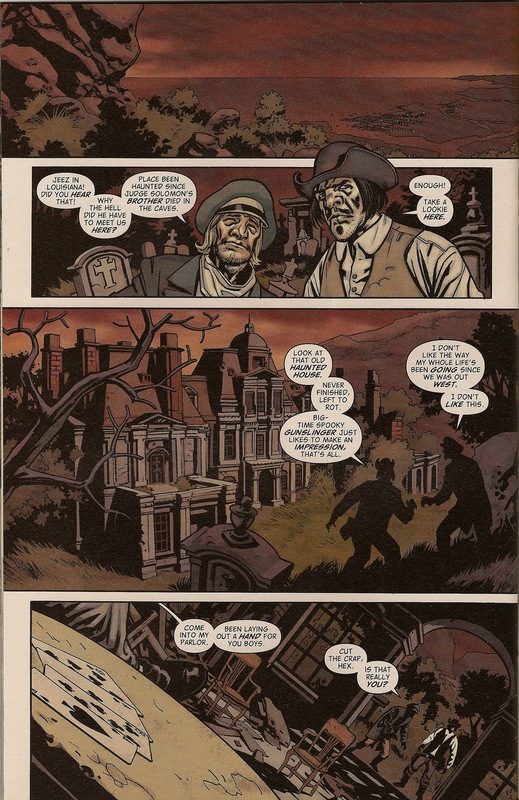 During their investigation, Hex and Arkham stumble onto the Lords of Crime (as well as Mayor Cobblepot). While they catch the man actually committing the crimes and the police break up the Lords of Crime,, Jonah still hasn't located the bounties he came for. He is offered a position with the GCPD (which he turns down) and then he finally locates his bounties when they murder a girl they had kidnapped. Jonah dispatches the bounties per his usual method and is then hired on the street by the fabulously wealthy Thurston Moody. Moody's son has been kidnapped and Hex turns down the job, citing a burning hatred for Gotham. Moody tosses out the sum of $50,000 as a reward and Hex takes the job. During the investigation, Hex and Arkham once again cross paths and they uncover a massive operation deep beneath Gotham where children are being used as slave labor to build the city sewer system. The pair are discovered and tossed down a whirlpool and find themselves stranded on a ledge in total darkness. They are eventually set upon by the Miagani, a lost tribe of Indians living far beneath Gotham. During their attempted escape from the Indians, they are attacked by a giant (no, really GIANT) bat. Jonah kills the bat and earns the respect of the tribe, which show our heroes the way out. Upon emerging from the cave, they find themselves outside Wayne Manor. They obtain the help they need from the police to break up the child slave ring and go after the man who started it all, Thurston Moody. Thurston, whose home has quite a few owls, is gone from Gotham and is supposed to be in New Orleans. Hex heads out to find him and we are unaware if Arkham comes along for the ride or not. However we do have the promise of Nighthawk and Cinnamon waiting in the wings. So what do I think? I am loving the hell out of this book. The Gotham elements aren't too heavy handed. Mayor Cobblepot makes sense and I liked the fact that the Wayne Manor looked like the house in the Return of Bruce Wayne books (and I'm hoping that horrendous appearance of Hex has been retconned out since this is the New DCU). I'm not reading the Batman books but I have heard some of the Council of Owls but not enough to get excited or have an opinion about the owls in Moody's house (other than they looked creepy). A lot of folks have compared Hex and Arkham to Holmes and Watson, but I think that Arkham serves another purpose. He is the narrator of their adventures, he is the voice we hear, we experience his insight into the mind of Jonah Hex. Rather than the omnipresent narration of the past (Meanwhile at the the ranch) or the current practice of having the heroes tell their own stories, we get what Palmiotti and Gray do very very well, stories told from a viewpoint of bystanders. I do like that Gotham and the whole mythos does not overshadow Hex as a character. It will be interesting to see if Hex returns to Gotham and Arkham and how long he might stay. I have to admit I am looking forward to having him meet Cinnamon and Nighthawk and see what that adventure holds. The artwork is fantastic, at times looking like woodcuts and really evoking a look of the time period. The colors are strong and the whole atmosphere of the book is spot on. On top of that, we also get a backup story of older characters (El Diablo) and a new one (The Barbary Ghost). I guess to sum up my opinion of the book thus far is that All Star Western is a heavy hitter in the New 52 roster and that it appeals to Western fans as well as the Batman folks. At least once a month I read of someone picking up the book and loving it, someone that formerly had no interest in Jonah Hex or westerns. I think that people that are looking for a hidden gem in the DC universe would be well advised to spend the $4 to try out this book.